Using a Kampa Prestige Caravan Cover for storing your caravan keeps your caravan clean and mildew free. An easy to fit, practical storage solution for the winter months or long term storage. 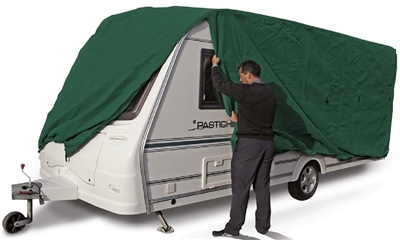 These covers offer ultimate protection against sun, rain, snow, dust, bird lime, tree sap, airborne pollutants and heat build-up.Suitable for nost caravans up to 225cm wide. 2 Year warranty on material. The cover is as described & easy to fit if there are two people. We have an old Abbey & the cover fits fine. I like the green colour as it does blend in with my garden unlike a previous grey cover. Overall I am very pleased with my purchase and the price. I would definitely buy another one in the future if needed. Surprisingly good quality for the low price. A bit fiddly to put on because of the height of the caravan but once on fits snugly she looks as though it will provide good protection. On of the straps was loose but it seemed like too much trouble to return it so I shall try and sew it back in place. A very well made caravan cover that matches one I owned for a previous caravan, that cost much more in real terms. The fabric seems to be tailor made for the purpose and should save many hours of tedious cleaning. This cover is fantastic. Very high quality, easy to use and reasonably priced. It covers the caravan all the way down under it and seems very secure with the straps on. Very pleased. Does this product have straps to go under the caravan and secure on the other side please?